Crafting with recycled materials is so addicting. I’m back with another green crafting project using a thrift store t-shirt I got free as it had a bleach stain. It was a pretty pink so I thought it would make a nice baby bib. This baby bib is crocheted from the t-yarn I created from the old t-shirt. Here is my tutorial on how I create t-yarn and how I curl it before crocheting. This baby bib uses about half of an adult sized seamless-sides t-shirt which has been cut into 1/4″ wide strips. I had shared another t-yarn baby bib before but this crochet pattern has been simplified and makes for an even quicker project. I added flowers as an extra embellishment. I hope you enjoy this free baby bib pattern. This month over at the Trash to Treasures group on Ravelry we are having a fabric and clothing scraps challenge. So I broke out some old jeans I have been saving and recycled them into some baby bibs. The first bib is larger and I used the trimmed side seams from a pair of jeans for the bib ties. This bib is more suitable for an older baby or toddler. My next bib is smaller and features ribbon for the ties. I thought the ribbon would be gentler for a younger baby’s skin than the denim ties. Here is my latest t-yarn or tarn project that is created from recycled tee-shirts. I cut an old white tee-shirt up into a very narrow strip about 1/4 inch wide. The shirt I used had no side seams so I just cut around and around the body of the shirt to create one long strip. I then gently pulled on the strip to curl the t-yarn into a nice thin strand which I used to crochet this baby bib. Here is a tutorial on how I cut and curl the t-shirts into curled t-yarn or tarn. So if you haven’t already tried crafting with recycled t-shirts, check out the process and give it a go. It’s a great way to repurpose those old t-shirts into cool new items. Here is another item that I have wanted to make out of plastic bag yarn. 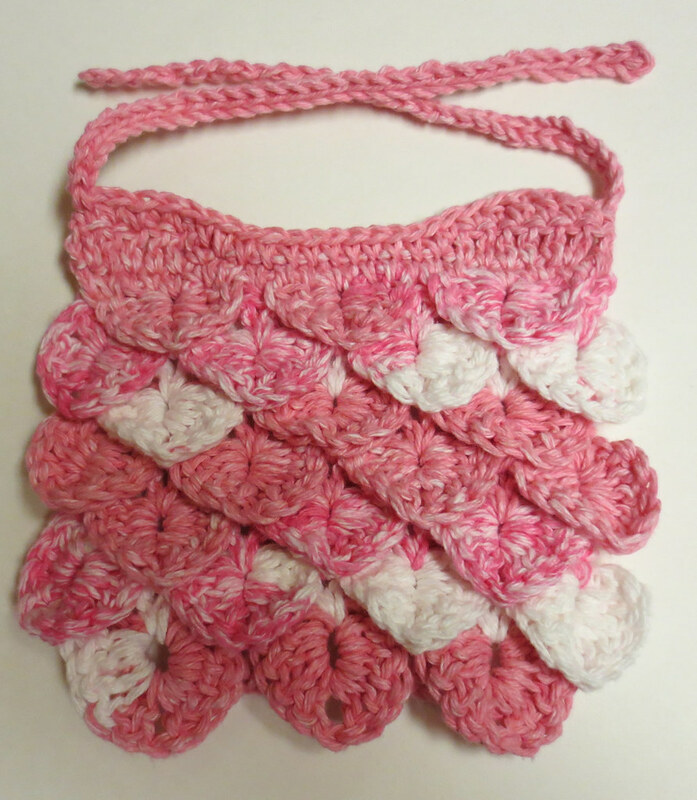 It’s a crocheted baby bib made using recycled plastic bags and cotton yarn. I added the cotton to give the bib some absorbency. You can just wipe it clean or machine wash as needed. Line dry only! If you put it in the dryer, the plastic will melt. The bib has a small Velcro closure on the top for easy on and off. I cut just a small square from a long strip of Velcro that I had. It’s about 3/4 of an inch wide and is machine stitched to the back side of strap. I used white plastic bags and some leftover blue variegated cotton yarn for this project. But you can probably use just about any color combination you desired to create your bib. I finished off my bib by working Sc stitches all around the outside edge and neck opening using just the cotton yarn. This gives the bib a nice smooth finished edge. Work project by holding one strand of plarn and one strand of cotton together as you crochet.